Wondering ​if your ​cat deserves a stocking in place on the mantle. ​Debate no more. Even if your cat doesn’t ​love ​presents the stocking will look ​absolutely amazing. But let's hope they appreciate you thinking about them and get to ​the 11 Best Christmas Cat Stockings! 9. Dear Santa, I’ve Been a Very Good Kitty! ​Are Stockings Safe For Cats? ​When Should I Add Presents? ​What Type of Presents Should I Buy? ​Glitzhome provides over 50 selections of Christmas stockings, and on the bright side, they have one specifically focused on our feline friends! ​This hanging stocking by Clever Creations is the perfect way to bring Christmas cheer to your home this holiday season. This stocking has a unique design that you simply will not find anywhere else. It is sure to give your home that wow factor and bring the Christmas spirit into your home. If you’re into cats then you’re definitely aware of Hello Kitty. This stocking uses the likeness of Hello Kitty to bring you a one of a kind stocking for your furry little friend in the house. Any cat will be excited to have a wonderful feline friend in the house gracing the mantle for the holiday season! ​Cheap Chic is a brand known for bringing great looking, but affordable products to the market. 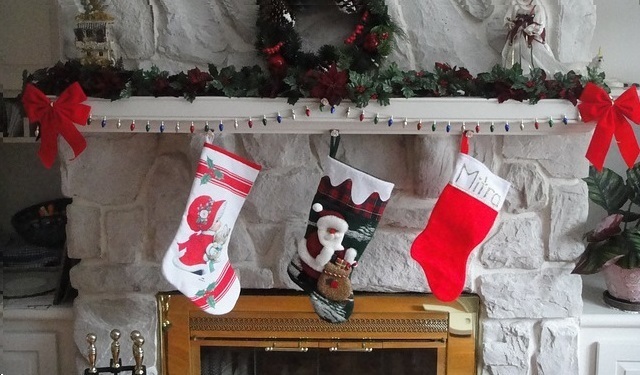 They’ve definitely hit the mark with this cat friendly stocking! It has adorable green paw prints all over it and it says MEOW in giant letters with a cute little image of a cat sticking out through the letter O. Hard to go wrong with a stocking that looks this good. ​If you’re looking for a unique stocking design then this is going to be it. There’s only one other one out there that looks remotely like it and that was listed up above. Northlight has brought another amazing looking cat focused stocking to the market and the white band along the top allows you to personalize it. ​If you enjoyed the movie 101 Dalmatians (yes I know it is a dog movie!) then this stocking is going to be right up your alley. It has about 100 little black paw prints on a white background to make it look like kitties stepped in ink and walked all over it. It reminds me of that wicked and crazy Cruella Deville. The white section on the top is left fully open for naming meaning you and your family can personalize it for your individual pet once you get it home! ​If you’re looking for a discount stocking for your kitty cat then this is definitely the route to go. Greenbrier brings to market the most affordable of all the stockings in the list with their Felt Christmas House Cat Stocking. Honestly, how can you go wrong when you can let your kitty celebrate the holidays with you for a price like this?! It comes in at just a bit above 5 dollars (last I looked on 10/15/18). ​If you like cat paw prints and little tiny mice then boy do I have the stocking for you! This stocking is adorned with numerous cat paws and even has five little green mice strapped across the top to make it any cat’s dream! On top of this you can also personalize this stocking through the provider with any cat name up to 12 characters long, quite a nice perk! You’ll also note that based on the shape there’s a good chunk of space in the ‘foot’ section of the stocking for any extra large gifts or treats for your kitty. ​Let’s be honest, most of our kitty cats probably shouldn’t be writing letters to Santa Claus telling him that they’ve been good. They’ve likely been spoiled rotten and still been a little bit of a turd throughout the year. I mean, come on, we’re already buying them a stocking! What more do these fur balls need? ​This particular stocking falls outside the normal shape and size of your typical stocking, but that doesn’t take anything at all away from how adorable it is! This stocking is shaped just like a cat paw and has a nice plaid cat paw emblazoned across it, right where the wrist is there’s also a cool little set of fish bones hanging down just to drive home that it is a cat’s stocking, no dogs allowed! ​While the stocking is geared toward dogs (take a look at the name), many folks have indicated they’ve used it with cats to great success. Who would have thought that cats wouldn’t complain about such a thing?! This is a gorgeous red stocking fitting the more traditional profile and it comes in two different sizes which is a nice perk if you’re cramped for space or don’t plan to pack it too full. ​There are two significant risks you can run with stockings for cats. The first and most prevalent is in the way you hang your stocking. They might jump and grab onto the stocking thinking of it as a hanging toy. The counterweight could easily land on your cat in the first case and cause a severe injury. In the second case it isn't likely to hurt your cat, but it could easily cause some damage to the surrounding area. I recommend an old fashioned hook in the bottom of mantle if you aren’t opposed to it. You may want to choose one that isn’t terribly strong / bends easily so that if your cat does happen to jump up and hang on the stocking the hook simply let’s the stocking go. You can always change it out the day of Christmas for a stronger hook! Another option is to look at the very lightweight ​counter balance options available that require a full stocking to be placed on them. This is a viable option if you don't want the stockings out for a long time or if your cat isn't likely to care what's inside them. This may sound obvious to any of you cat owners with extremely curious and mischievous cats, but you’ll probably want to hold off on loading up that stocking with presents until the night before or even the morning of present opening time. 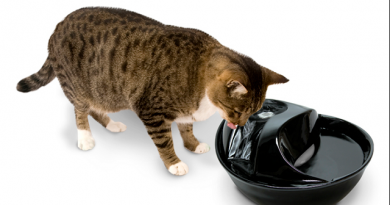 ​ Your cat may go totally nuts like this one. ​Loading up the stocking early, especially if you include items with catnip or any other scents cats are interested in, could end up causing lots of damage. 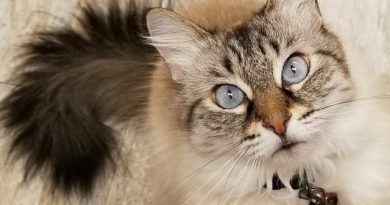 ​Curious cats can cause all sorts of havoc and not only are they likely to knock the stocking off, but they could easily start chewing up packaging if the gifts fall out. We all know that is no good for them. Age: ​Buying items that are age appropriate will help ensure engagement and use. You probably don't want to buy a top loading litter box for a 14 year old arthritic cat. Just cause it will be nice for you doesn't mean it'll be any help or any use to your kitty! Size: Be sure to look for items that are size appropriate for your fur ball. Most cats toys on the market are simply too big and aiming for smaller toys will encourage more play time! ​Personality: If your cat loves to just relax and isn't into playing then I wouldn't recommend buying a boatload of treats that might encourage you to share them and fatten your kitty up. Exercise Related: Always aim to buy something that will keep your kitty active! Just like us humans, cats that stay active stay far healthier! Get a leash or harness or buy a clicker and start clicker training your feline friend! Catnip: Small and easy. It is great to get cats to re-engage with old toys too! ​Hexbug Nanos: Hexbugs are amazing toys that are battery operated and drive cats nuts! Laser Pointer: The laser pointer is still a classic go to for most cat owners. Be sure to end any play sessions with some treats or a real toy. ​Cat Tunnels: Cat tunnels are great toys that are lightweight and collapsible so they'll be easy to fit in the stocking and your cat will love them! Empty Boxes: I know these don't fit in the stocking, but at the least you'll have boxes from your other Christmas presents. Save them and unveil them all at once for an amazing cat present! The market has about a zillion different items out there focused on enticing us to make a purchase for our cats this Christmas season. While some of them are items that will likely not get used much after the box is first opened, there’s no need to worry about whether or not your cat will use a stocking! We humans will take care of that for them! A fashionable stocking is a wonderful way for you and your family to ensure your kitty can celebrate the holidays in all of their glory! Not only can you stuff them full of fun little gifts for your fur ball, but on top of this you can also use it as a temporary bed or pillow for your cat once they’ve tired themselves out from all of the playing! If you have any other ideas for your cat around the Christmas holiday that you love please please leave a comment below or send me an email at Craig@StuffCatsWant.com so I can update this article. Craig this is certainly a top ten I wouldn’t have thought of in a million years, but I hadn’t thought of sprucing up my cat for Christmas before. Great list! Thanks for reading, glad you like the list. Good stuff Craig! My mother and sister are the biggest cat lovers ever! Over the last 20 years, I have always got them something related to cats. As you might have guessed it can be really hard to come up with ideas because they have so many cat things from the previous years. I’m also looking for some little tiny ones for their cats. Yes, they fill their cats stockings with kitty treats. They currently have stockings, but I want to upgrade them to something better. Got any ideas? 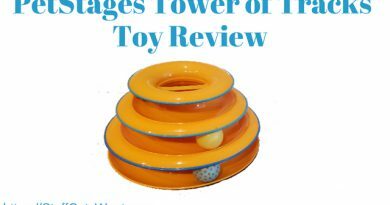 You can check out my list of the top toys for indoor cats. I would personally say that some of the little floppy fish with catnip inside of them might be a fun and easy gift to fit into a stocking! Oh wow these are adorable! I have two cats (Meeps and Kenji) and they’d go crazy for a stocking full of kitty treats! These would be perfect for them, actually probably for my girlfriend too! That’s a great idea to use the stocking as a pillow or bed once you’re done using it. My cats are always looking for comfy places to sleep! Because of the embroidery on the stockings, would this make them not machine washable? They’ll get really hairy and dirty if the cats use them around the house, so it would be good to be able to toss them in the wash! You’d have to be careful and you’d probably want to put it on delicates if you machine wash it after you embroider it! Craig, I found your advice particularly useful, especially in light of the fact that, for the first time ever, we are going to have a cat this Christmas – it’s my step daughet’s cat Jimmy, and we have never been cat owners ourselves, so we need all the help we can get. The choice of stockings for kitten, I have to say, is endless. But I particularly found helpful the suggestions you give about keeping stockings and presents out of reach. As dog owner, I can see that beating feline agility can put your imagination to the test 😅 Once again, thank you ever so much! Glad you found it helpful! If you have any questions be sure to let me know! Mine only love what comes inside the stocking haha, I don’t think they care about it themselves! But We like having them for the the holiday spirit!